So, your infants started to explore the crib and roll in the night. Motor neurone development at six months is always exciting to see, but it’s a problem for parents. How can you stop them from slipping into the slates or hurting themselves in the night? The traditional answer was to invest in crib bumpers. These thick, foam items are placed on the four corners of the crib to prevent your baby getting injured. Unfortunately, recent studies by the American Association of Paediatricians (AAP) has found crib bumpers aren’t the safest option. 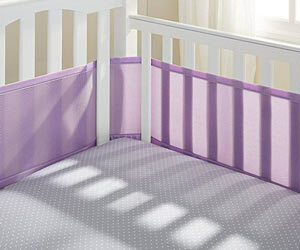 Step forward Breathable Baby’s mesh crib liner. It carries out the same functions as crib bumpers but with a breathable, bruise proof mesh fabric. They even come in a variety of colors, designs and shades.Today, we’re looking at 7 of their finest fabrics to improve your baby’s crib. Before we dive right in to our reviews. It’s worth looking at what the experts are saying about crib bumpers. Here are the 7 best breathable mesh crib liner to buy in 2019. Breathable baby is a company run by parents, for parents. 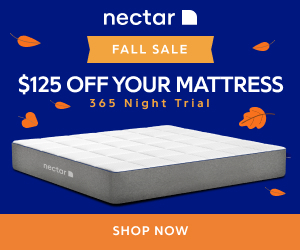 Their journey began in 1999 when they searched for an alternative to crib bumpers. 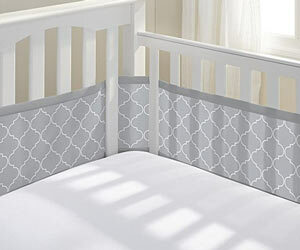 This breathable mesh crib bumper is designed to keep your baby safe inside a crib. The fabric is a mesh weave which allows air to circulate into the crib whilst wicking away heat. 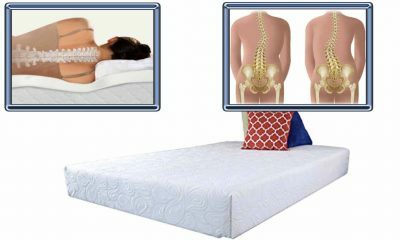 Mesh linings are safer than baby crib bumpers but fulfil the same basic premise: to prevent limbs slipping into the cracks between the mattress and the crib’s edge. The fabric has been woven using Air Channel Technology (ACT). It promotes airflow but cannot be compressed to form an airtight seal. Using ACT helps to reduce the risk of suffocation or insufficient access to air. 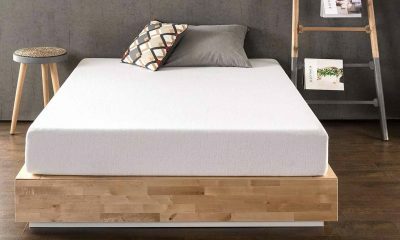 The lining itself is adjustable which means you can taper it to your crib’s size. Once it’s setup the mesh doubles up as a cushioning barrier which reduces bruises from night movements. 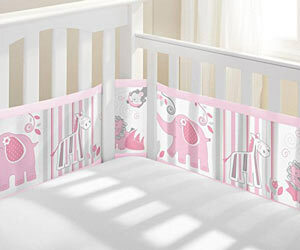 It covers all four corners of the crib and has passed all safety tests and certifications. Featuring the same design, Air Channel Technology and mesh fabric this product comes in a natural feeling lavender color. Stretched over the four corners of the crib we can’t help but admire the subtle and stylish result. Lavender, as a color, goes particularly well with white based cribs. 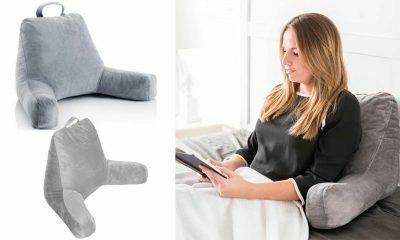 Modern, minimalistic design, which frequently uses shades like black, grey or white can sometimes come off a little cold. This pastel lavender brings a little warmth into your babies sleeping environment. As above, this crib liner is made from a mesh. That circulates air and helps to regulate temperatures inside the crib. The design also lets a lot of light through during daylight hours. We’re pleased to see that, even in the lavender finish, the light is still able to squeeze through whilst providing a soft relaxing tint to your baby’s sleeping environment. If you’re thinking of investing in the lavender option, consider the color of the room, crib and clothes your baby usually wears. Matching up will bring a unified feel to your environment, letting you bring the crib from the bedroom to the living room with minimal hassle. Still not convinced by this shade? Read on to see what else is on offer with these stylish crib liners. Ecru is technically not a color. It actually refers to silk material that hasn’t been bleached or dyed. It provides an Brunderstated beige to the crib which is not too overpowering but subtly enhances the crib with a hint of luxury. Out of the box, the ecru variation might seem a little strong. If you have a smaller crib take advantage of the opportunity to adjust the fabric. Once stretched out, the beige color is lighter than expected and lets the light through. 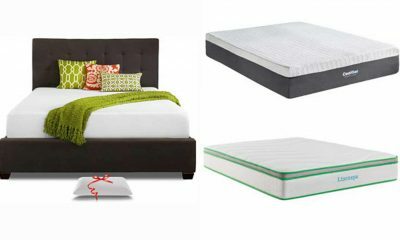 The best color combinations for ecru are in a white or black crib. In a white crib, ecru adjusts the tone in a way that is pleasing to look at for you and relaxing for your baby. In a black, or dark wood crib, the ecru will stand out a little more and adds an oriental touch to your baby’s crib. As always, the fabric itself remains the same. That means it prevents your baby’s limbs from slipping down the side of the crib as well as reducing the risk of bruising should they role in the night. Go for Ecru if you want to add a subtle shade to your crib. In the early stages of life, we are less able to distinguish objects. We rely on smell as much as we do sight. However, it’s important to provide a stimulus for young children to help them develop their cognitive processes. The Safari Fun Girl, mesh liner is a playful imprinted design that will help develop your child’s imagination. Exotic elephants and zebras are printed on the liner which still allow light through, coloring it a beautiful shade of pink. Like rattles, mobiles (not the phones) or other kid’s toys, bright colors help to hold your child’s interest. If you’re stuck for a bedtime story there’s also plenty of inspiration to take from the mesh liner as well as an opportunity to teach them about different animals. All in all, this mesh liner is designed primarily as a bit of fun. Brighten up your crib with interesting and exotic ideas safe in the knowledge that your baby’s in a safe, breathable sleeping environment. You could even try matching it up with some funky sheets. Looking to add a calming environment to your baby’s crib? The Aqua mesh liner is for you. Bringing associations of cool water and oceans this particular really helps to color the light that enters the crib. It fits snug to US standard crib sizes but can be adjusted to suit mini-cribs among others. Blue is primarily a calming cover which will help your baby to feel relaxed at night. Combining with a white, or aqua crib will really get the best out of it. The print used in the mesh is dyed in the fabric and won’t release any harmful emissions, so it’s really a question of personal taste. We’d recommend looking at the kind of colors in your baby’s bedroom as well as the covers or sheets you already use to make sure you get a good match. As always, this mesh crib bumper/liner is well-built and relatively cheap. In line with Consumer Protection law there’s a 30-day return policy provided you haven’t used it. If there’s a problem fitting it into your existing crib you can always adjust the tapering to get rid of excess material. Probably not the most exciting color, but that’s more than made up for by the African influenced Moroccan print. 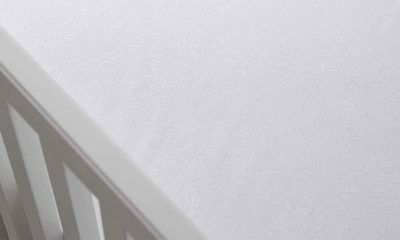 Textured to reflect the brilliant design of Granada’s Alhambra, this mesh liner will add an exotic feel to your baby’s sleeping environment. The advantage of opting for a grey color scheme is that it won’t be too prominent. A subtle touch which will go with most sheets as well as the surrounding room. If you already have a lot of shades though, this mesh liner might make the crib a little dreary. 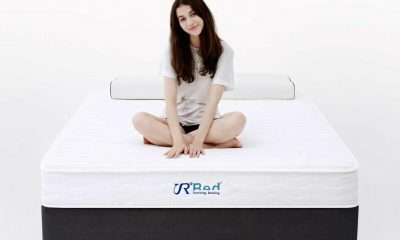 The design comes with no padded sections which helps to reduce SIDS. In addition, it lets light in ensuring a bright environment for your baby during the day. The fabric helps to absorb impact which means you won’t risk your baby picking up bruises once they start to roll. This particularly is best suited to a white painted crib. Combining it with a darker wood, or black crib will make it appear a little dull. The print design is unique and will go perfectly with an eastern themed bedroom or living space. 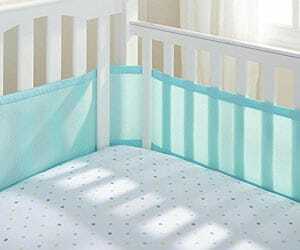 Similar to the aqua color above, this light blue shade will add a calming feel to your crib. Perfect to combine with a bright crib, the mesh fabric will let in light and improve the airflow in your baby’s crib. 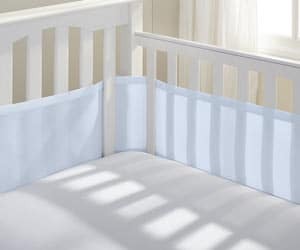 Crib bumpers tend to block out the light and also pose a threat to your baby. 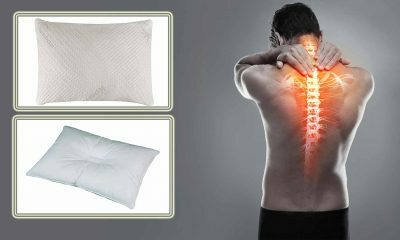 This mesh designed fabric is an innovative technology that reduces the risk of bruising. Available in a wide variety of colors, the light blue is ideal for adding a bit of color without over-exciting your baby or clashing with the surrounding environment. When we took this liner out of the box it appeared a lot darker than we expected. Thankfully, once we stretched it over the corners of our crib mattress it brightened up considerably. As a rule of thumb, try not to match it up with other bold hues in order to get the most out of it. 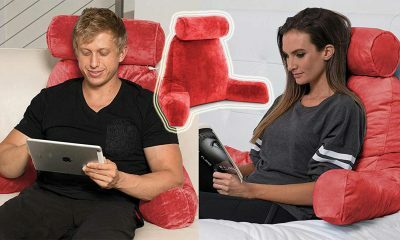 What we liked about these products was just how easy it is to install. Simply loop the handles around the corners of the crib mattress to create a soft barrier between your child and the slates. Mesh is far more breathable than bumpers, so you won’t be restricting airflow or risking your child getting too hot. 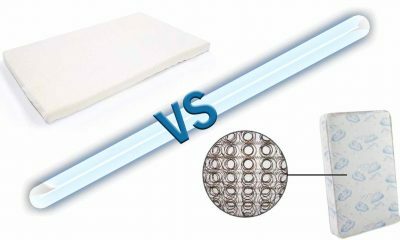 Breathable Crib Bumpers VS Mesh Crib Liners – What Should You Choose? So your thinking of investing in a crib bumper to protect your child? There’s a few things to consider before you take the plunge. 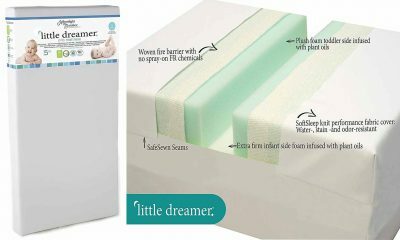 Despite crib liners appearance, a soft but sturdy barrier wrapped up in easy to clean vinyl covers, these actually increase the risk of SIDS. According to a study from 1985 to 2012, 46 cases of SIDS and 146 cases of infant injuries were linked to crib bumpers. 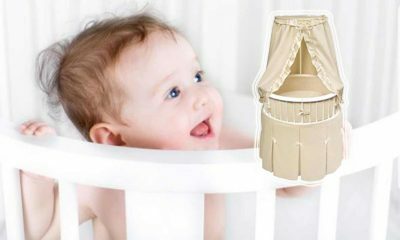 The Consumer Protection and Safety Commission of America has even advised parents against investing in a crib bumper. So, why do these bumpers still feature on our store shelves? The answer is that they’re popular. It’s a quick fix to a problem all parents face while the evidence against them isn’t strong enough to ban them despite expert opinions. Thankfully, there is an alternative solution. 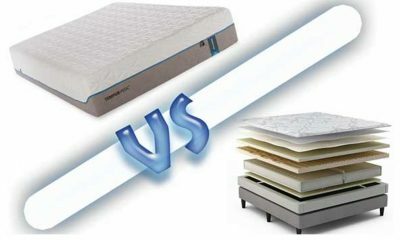 Mesh liners fulfil the same function of crib bumpers. Like bumpers, they fit inside the crib and prevent their limbs getting caught in the slats. Unlike bumpers, mesh liners are made using breathable fabric which reduces the risk of suffocation or rebreathing. Still need convincing? 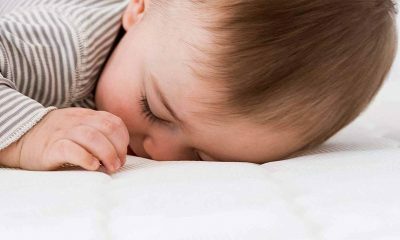 The American Association of Paediatricians (AAP) recommend against using crib bumpers, even when your child starts to roll . Rolling in the night is a natural occurrence but that doesn’t make it safe. If you have to invest in crib protection, the best thing to choose is a breathable mesh fabric. 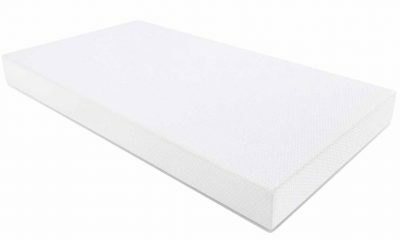 Crib bumpers are made from thick materials which don’t allow airflow. If a baby rests their head against a crib bumper there’s a chance they could cut off their oxygen supply. 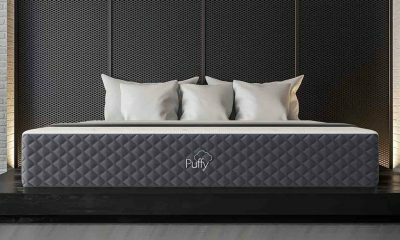 The vinyl outer shell used in crib bumpers will crack over time causing scratches and allowing the inner foam to become contaminated. Mesh liners are usually made from fabrics that don’t contain harmful chemicals and frequently have a Greenguard gold certification to prove it. The mesh is a thin fabric which means it won’t trap your child’s limbs between the outer edge and the slats. Mesh is 100% breathable reducing the chances of breathing issues whilst also allowing light into the crib. The springy design of mesh means will reduce the chance of your child getting painful bruises. Fully machine-washable to ensure a hassle free, but hygienic environment for your child. First and foremost, we choose to listen to the experts. Mesh liners are recommended by the CPSC and the AAP. In the US alone, 3,500 infants die from SIDS and other related breathing conditions. A breathable liner is one part of the journey to ensuring that doesn’t happen. The logic put forward by the AAP comes directly from their admission that as few objects as possible should be present in a child’s crib. Crib bumpers present a threat because children could get pushed up against them preventing them access to air. On a mesh line the air flow will always remain open regardless of the pressure on them. It’s a frequent occurrence that crib bumpers won’t fit perfectly in the crib. Mesh liners, on the other hand, can be adjusted to fit. Either wrap the material round twice, or cut it to length to ensure a fine fit. 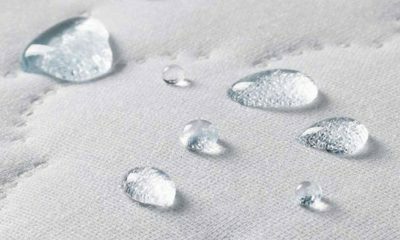 The light-weight fabric is also a single piece that can be machine washed. There are less complex materials in a mesh liner than in a crib bumper. That means parents can pick one up for less than $25 on today’s market. 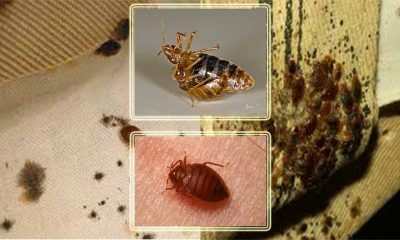 Add to that the resilient properties of mesh fabric and you get an exceptional lifespan from an inexpensive investment. 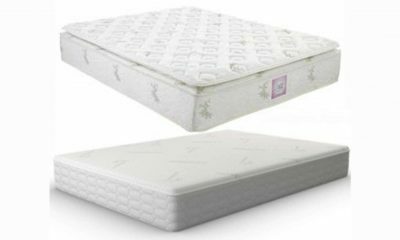 Mesh liners are fitted to the bottom of the mattress or crib using elastic straps. The benefit of this method is that there are no gaps or loose parts. Fitted inside the crib the mesh provides a cushioning surface that remains breathable even if a child pushes against it. The fabric acts as a cushioning barrier between the hard-wooden slats of the crib and the baby. Even if the baby comes into contact with the mesh at high-speed the chances of bruising are reduced because of the shared impact. Not only are mesh fabrics breathable they also let light into the crib. This is especially important if your child spends time in the crib during daylight hours. Available in a range of calming pastel shades, mesh fabrics help to create a warm atmosphere in the crib. Crib bumpers, like many baby products, have been a part of American society for a long time. That makes it seem like a no-brainer once your baby begins to explore the crib or role in the night. It’s also a lucrative industry and available on most store shelves. These bumpers are frequently inexpensive and promise to keep your child safe. Unfortunately, there’s very little evidence that crib bumpers actually make any difference when it comes to your child’s safety. According to the AAP, they even increase the likelihood of SIDS. One of the issues, is the inability of independent bodies like the AAP to convince government of outlawing these products. If they remain legal, and available, parents will invest in them. This is largely an issue with CPSC which had an opportunity to outlaw crib bumpers but failed to do so in 2016- citing a lack of evidence. If products like crib bumpers are readily available, it makes sense that parents will invest in them. Most parents adopt a better safe than sorry mindset but should be carrying out their own research on what exactly is going into their baby’s crib and the safety issues that entails. 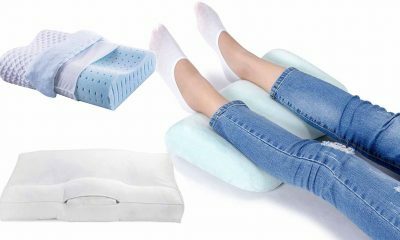 Crib bumpers are made from a fabric which doesn’t permit airflow. 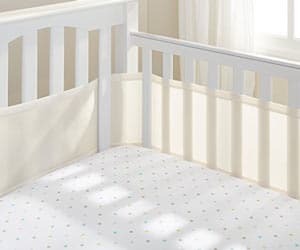 Should a child accidentally roll against a crib bumper, they risk cutting off their access to oxygen. Obviously, this doesn’t happen in the majority of situations, but it still poses a risk. The new regulations brought out by the AAP clearly state that no excess objects or obstacles should be placed in a baby’s crib. Of course, that means removing any toys but, importantly, covers crib bumpers as well. Crib bumpers, not only take up room, but also become an additional object that babies could interact with. The AAP believes that the less obstacles in a baby’s crib the lower the likelihood of SIDS will be. According to the AAP, no evidence has been found to support the claim for crib bumpers. Surprisingly, these products don’t improve the safety of the child, nor do they prevent a baby from getting their limbs caught in the slats. 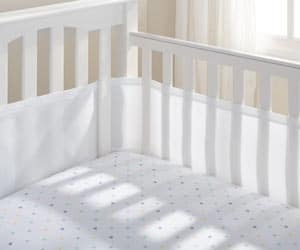 Given the higher risk of suffocation posed by crib bumpers, and the lack of evidence they add safety to a crib, the AAP recommend against using crib bumpers. 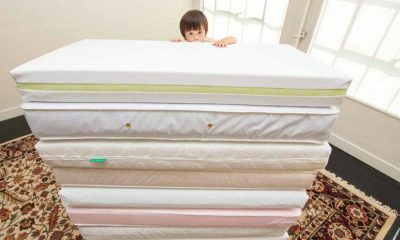 Part of the AAP’s reasons for recommending against crib bumpers is a wider consensus in the field. The Consumer Product Safety Commission actually blocked the AAP from banning crib bumpers in the US in 2016. The reasons behind that were an independent investigation that showed no significant danger of using crib bumpers. The problem is that the CPSC used highly questionable research in their review. This research has since been discredited by the AAP, and in particular leading scientist Rachel Moon. Rachel Moon went on to strongly urge parents not to invest in crib bumpers at all. If you’re worried about your child getting their limbs caught in crib slats then investing in a mesh liner will take a weight off your mind. 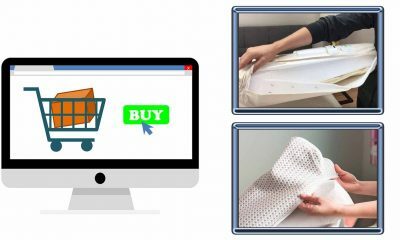 If you have any further questions regarding crib liners you can visit the AAP homepage or check out some of the other resources linked in this article.